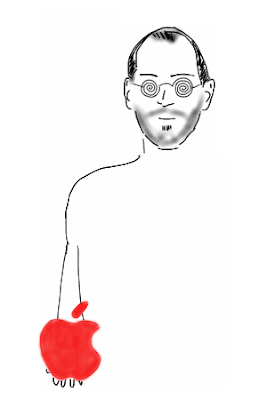 All hail... Steve Jobs and his iPad? I want to start by saying that I might buy an iPad, and definitely like it, in an abstract setting. But I think that Steve Jobs is kind of blind through his own charisma. He likes the iPad... then it should be liked (and bought) by everyone. I don't think the iPad is gona be a hit. It would, if it was priced 200$ below its said price ($499-->$299). At that price, it would surely break the market. I would definitely buy one. But at the current price, it is exactly what almost every Apple geek was hoping it was not: an oversized iPod Touch. I love my iPod Touch... and of course, a bigger one would surely make my day. Not at that price, though. It is not really good as a book reader (LCD vs eInk was a battle lost a few years ago), nor as a video player (why should you be at the sofa, at home watching it in front of your real TV?). You can't exactly work on it on whatever you want: it runs iPhone OS, not Mac OS. What everyone was hoping on the iTablet, iBook, or as it turned out, iPad was a tablet powered by Mac OS, or some new cool operating system that would do the job. A gadget that could replace your laptop on short trips, where you could keep on working on whatever you were working in your office/home. But they give us an iPod Touch x 4... You can just work on writing emails, and I think in Pages. Oh, or Notes. My iPod is jailbroken... so I can do a lot more things on it... But why should I be forced to do this on a $500 gadget? It should work *better*, right out of the box. And it can't. But, on the other side, as a $300 gadget... it works pretty decently as a book reader (I read on my iTouch regularly), it can play music, draw and watch HD videos. For the price difference, you expect "something more", if you don't have it you can get over it... or don't.